The ingredients in this dish are delicious, nutritious, filling, easy-to-prepare…what more could you ask for? Well- maybe more. They are also completely vegan and whole food plant-based. That means that they are made from the most wholesome ingredients, all minimally processed. In other words, ingredients that come from plants, not made in plants. The Rainbow Buddha Bowl comes together in mere minutes…particularly if you, like me, do yourself a favor and batch cook. By that I mean, prepare some of the foods in bulk, put some in the fridge and store the rest in the freezer. Such a great time saver. Both brown rice and lentils are perfect candidates for bulk cooking. The Rainbow Buddha Bowl comes to life with this wonderful Asian Peanut Sauce. Make a big batch and enjoy it with any number of dishes including this Spicy Asian Salad or Pad Thai – Peanut Noodle Stir Fry. 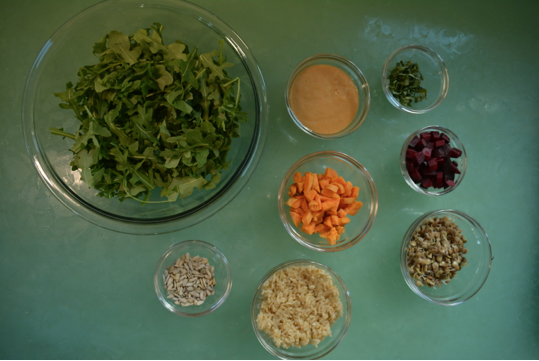 Here are the ingredients for the Rainbow Buddha Bowl. 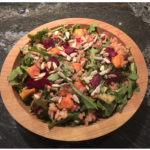 The recipe follows my 5-step Healthy Vegan Made Easy system for eating an abundance of health promoting foods. They can simply be mixed together in a bowl like this. Or if you prefer to section of the ingredients on top of the arugula or rice that would look pretty too! Combine the first six ingredients in a large bowl. Toss with the peanut sauce. Top with sunflower seeds, if using. 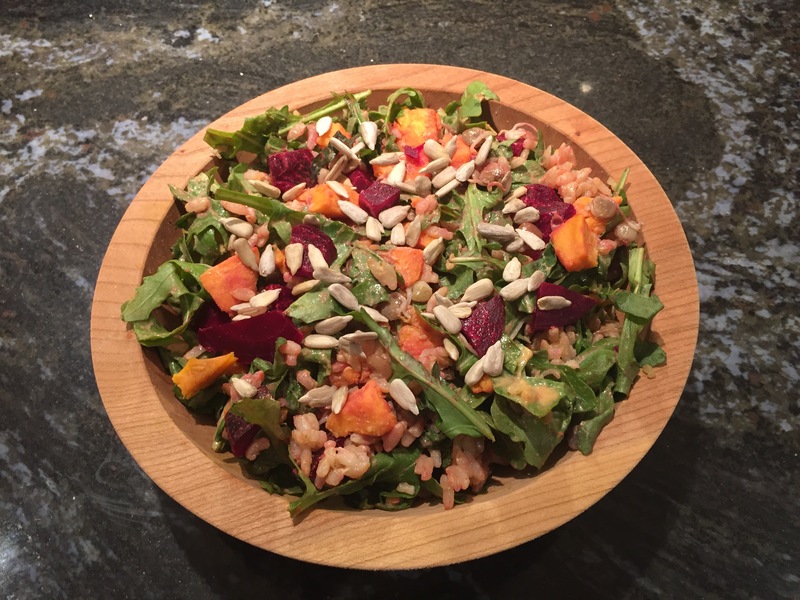 Another option is to place the arugula in a shallow wide bowl and then place the remaining ingredients in sections on top of the greens. Drizzle the peanut sauce on top.